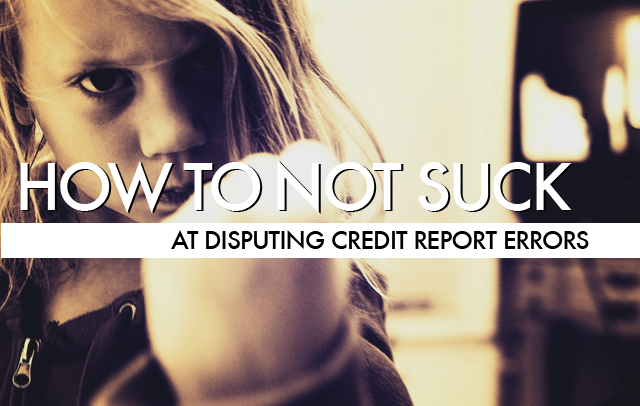 Like it or hate it, your credit report and credit score have lots of power. These may determine whether or not you’re approved for a mortgage, car loan, or other borrowing, and will determine the interest rates on your credit cards. This information is often even used when you’re evaluated for an apartment, insurance or a job, or try to get a bank account. That’s why it’s incredibly important to check your credit report for errors, as mistakes on your report can haunt every part of your financial life for years. Indeed, more than one-in-four reports contain errors, according to a recent Federal Trade Commission report. To make sure yours isn’t one of them, the first step is to check your credit reports once a year for any mistakes. You can do this for free at annualcreditreport.com (and not any of the “free” credit report or credit score sites that are just trying to rope you into a monthly subscription). This site gives you once-yearly access to reports from each of the three major credit bureaus — Equifax, Experian, and TransUnion. You can get that once-a-year free report directly from each of the bureaus, but watch out for come-ons that make it seem like you need to pay, or sign up for a credit monitoring service, to get the free report. If you’re turned down for a loan, insurance or employment based on a credit report, you’re also eligible for a free copy of the report used to make that determination. Regardless of how you get your hands on the report, if you find an error, fix it. Pronto. Here’s how. You need to contact the credit reporting agency — in writing — about the error you’ve found. The FTC offers a sample letter that you can use to make sure you don’t exclude any essential details. Your communication should include your full name and address, exactly which item(s) you dispute and why, and then ask that the information be removed or corrected. Include copies (NEVER originals) of any supporting documentation you have, plus a copy of your report with the wrong item(s) circled or highlighted. Be sure to send your dispute certified mail, return receipt requested, and save a copy of what you send to the agency. The credit reporting agency — per the Fair Credit Reporting Act (FCRA) — must investigate the dispute in 30 days if the report in question came to you because of a credit denial, or 45 days if it came from an annual free report. When they’re done looking, the agency must report back to you in writing its findings, along with a free copy of your report if there was a change. Importantly, it must tell you where the bad info came from (this is essential for Action Item No. 2, below). It’s terrific to have your credit report fixed, but if you don’t fix the source of the bad info, you can expect to see the mistake creep back onto your report in the years to come. Using the same FTC sample letter, go through the same process with the source of the error. If the credit reporting agency deemed your information to be inaccurate and made a change, include a copy of the correction. The FTC says if an investigation doesn’t resolve your dispute with the credit reporting company, you can ask that a statement of the dispute be included in your file and in future reports. You also can ask the credit reporting company to provide your statement of explanation to anyone who received a copy of your report in the recent past, and this may cost you a fee. But here’s the kick in the pants: Many consumers have found they’re able to prove, beyond a shadow of a doubt, that some items on their credit reports are wrong, yet the credit reporting agency refuses a fix. This doesn’t happen just with the Big Three, but also with smaller credit reporting agencies that specialize in reports for employers and landlords. Indeed, the Consumer Financial Protection Bureau found that such specialty reporting agencies weren’t always following the rules that it issued a bulletin [PDF] last year, reminding these firms they must give consumers an easy way to get a free copy of their specialty reports and comply with FCRA. Then, dear readers, you may have to get an attorney who specializes in FCRA violations. Whether you have errors on your report or not, you should know your rights. This page on the FTC website provides some helpful information for all consumers about access to credit reports. Have you checked your credit report? How Much Is A Company That Knows All About Your Financial Behavior Worth? Turns Out A Lot.